If you want to add a bit of Sicilian flair to your stay, you should pay Crupi a visit. 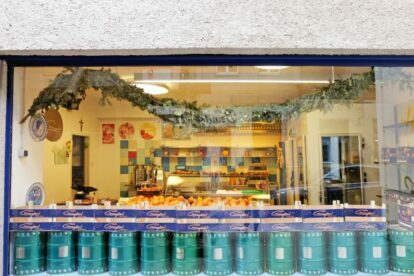 This gourmet food store is named after its owner Nino Crupi and is located at the very beginning of Margaretenstraße. This might come as a surprise to you, but it’s all about oranges! Hundreds of them are piled up in wooden boxes in the big shop window, originating from the family-owned orange grove right at the foot of the Mount Etna. The interior of the shop itself has only little decoration, no glitter or glamour, the focus genuinely lies on the products themselves. And those are fantastic! All of them are regional Italian, ranging from oranges (duh! ), to cheeses, sausages (like salami or prosciutto, but I’m a vegetarian, so not quite the expert here), pickled vegetables, honey, salted capers and just more of the same – true Italian miracles. When Christmas comes around, loads of Panettone, a traditional Italian cake that’s typically eaten around that time, are imported. Cartons of this cake are stacked up in towers and you might feel like you have just entered a miniature high-rise city exhibition. Be aware that offerings might change seasonally, but don’t worry, you won’t leave empty-handed, this I’m sure of. In any case, you’ll carry the pleasant scent of oranges with you for the rest of the day.